New Delhi, March 27 (IANS) Karnataka, where the Congress and the BJP are set to clash for major sweepstakes ahead of the next year Lok Sabha polls, will vote on May 12 in a single-phased poll to elect its new assembly. The 224-member Assembly expires on May 28 in the state where the Congress is currently in power, with 122 seats against the BJP's 43. Minutes before Chief Election Commissioner Rawat announced the schedule of the polling and counting, Bharatiya Janata Party's IT cell head Amit Malviya had tweeted the dates of the poll and counting day, sparking a row. 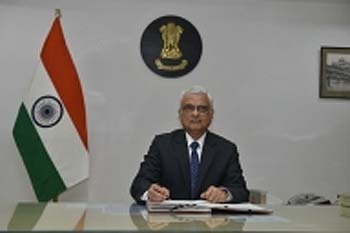 When questioned by the media about the "leak" of poll dates, Rawat first dismissed Malviya's tweet as "conjectures" but later said the commission would investigate the matter and take appropriate action. "People can have conjectures. You cannot stop conjectures. Let me announce the dates and see if they are the same...But certain things may have leaked for which the EC would take appropriate action," he said. However, as he announced the dates, it turned out that the scheduled date of polling - May 12 - was the same as tweeted by Malviya. The date of counting was different though. "Definitely, it will be investigated and when investigation delivers certain facts fix responsibility and whatever action legally and administratively befitting the occasion will be taken. Please rest assured." It also turned out that Congress party's Karnataka unit's social media in-charge, Srivatsa, had also tweeted the same dates at around the same time as Malviya, that is, 11.08 a.m. The poll panel announced the schedule around 11.20 a.m.
"VVPATs will be used along with EVMs in all 56,696 polling stations of 224 assembly constituencies of Karnataka. On a pilot basis, VVPAT from one polling station in each assembly constituency will be randomly selected to count VVPAT paper slips for verification of the result obtained from the control unit," Rawat said. Rawat also appealed to Karnataka's IT professionals to lend a helping hand in preventing any "malicious, divisive or targeted social media campaigns connected with any harvesting of data etc".